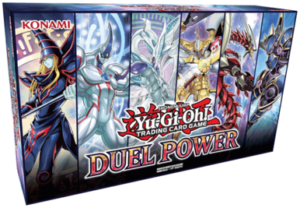 Home Featured Articles Duel Power – What You Should Know / Yu-Gi-Oh! Reprints and new cards galore! Hello Pojo Readers, Crunch$G here to talk about Duel Power, arguably one of the most hyped sets in a long time. This 100 card set is full of many reprints of high value, out of print cards along with some rarity upgrades and 40 new cards from the OCG to the TCG from various sets celebrating the 20th anniversary of the game over there, Link VRAINS Pack 1 and 2 prints as well as Link VRAINS Box prints, and Jump promos from over there are printed in here for the first time ever in the TCG along with a few other various new cards. This set also has a few alternate arts inside the set along with the 6 promos, it’s a very packed set, so let’s get straight on into it. Now beyond getting those nice looking alternate arts that I felt you all deserve to see, we can get into all the imports from the OCG in this set, starting with the cards representing the original anime series. 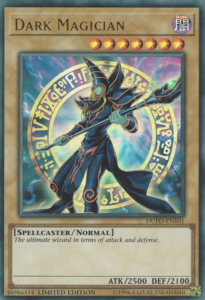 Magician of Chaos is a new Ritual that uses Chaos Form and synergizes with Dark Magician as it is treated as Dark Magician on the field and in the grave, can once per turn during either player’s turn target and destroy a card on the field when a Spell/Trap card or effect is activated, and when destroyed after being Ritual Summoned can summon any Chaos or Black Luster Soldier Ritual from your hand ignoring the summoning conditions. Dark Cavalry is a Fusion of Dark Magician and any Warrior, gains 100 ATK/DEF per Spell/Trap on the field and in the graves, deals piercing damage, and can discard a card to negate an effect that targets a card on the field. Draw of Fate is a Normal Spell that when your opponent has more life points than you and they control the monster with the highest attack (even with a tie) then you can reveal 3 cards with different names from your deck, place them on top in random order, and then draw a card but for the rest of the turn you cannot set Spells or Traps and can only activate one more card or effect. Bond Between Teacher and Student is a Normal Spell that when you control Dark Magician, you can summon a Dark Magician Girl from anywhere minus the banished pile then you can set a Dark Magic Attack, Dark Burning Attack, Dark Burning Magic, or Dark Magic Twin Burst from your deck. 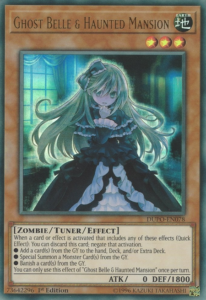 Dark Magic Twin Burst is a Normal Spell that lets you target a Dark Magician you control and let it gain ATK equal to all the Dark Magician Girls on the field and in the graveyards til the end of the turn. Magic Gate of Miracles is a Normal Spell that when you control 2 or more Spellcasters, you can change an opponent’s Attack Position monster to Defense Position, take control of it, and give it immunity from being destroyed in battle. 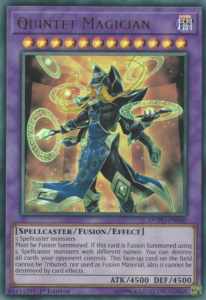 Finally, Quintet Magician is a Level 12 Fusion of any 5 Spellcasters and can destroy all cards on the field if fused with 5 Spellcasters with different names, but no matter what it has protection from being tributed, used as Fusion Material, and being destroyed by card effects. Now it is time for the cards that best represent the GX era. Elemental HERO Grandmerge is a Fusion of any two Normal HERO monsters, must be Fusion Summoned, gains ATK and DEF times the Levels of the monsters used as Fusion Material x300, and when it destroys a monster by battle then you can tribute it to summon any Elemental HERO Fusion from the Extra Deck ignoring the summoning conditions with the downside of it not being able to attack monsters with a lower level than it. Double Hero Attack is a Quick-Play Spell that if you control a HERO Fusion that lists Elemental HERO Neos as Fusion Material, you can Special Summon any HERO Fusion from your graveyard ignoring the summoning conditions. Nine-Tailed Fox is a Zombie that can tribute 2 monsters to Special Summon itself from the hand or graveyard, deals piercing, and if destroyed and sent to the graveyard can summon two Fox Tokens. Finally, Cyber Dragon Nachster is a new Level 1 Machine Dupe target for Cyber Dragons that is treated as Cyber Dragon while on the field or in the grave, can let you discard a card to Special Summon it from the hand, and when Normal/Special Summoned lets you revive a Machine with 2100 ATK or DEF in your grave but locks you to only summoning Machines for the rest of the turn. Up next is the 5D’s era with their new cards. 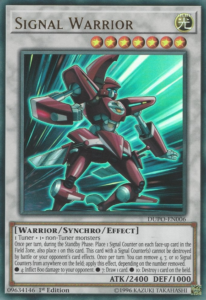 Signal Warrior is a generic Level 7 Synchro that basically recreates Speed World from the anime where during each Standby Phase, you can place a Signal Counter on each face-up card in the Field Zones and Signal Warrior and while Signal Warrior has a counter, it cannot be destroyed by battle or your opponent’s card effects, lets you remove 4 counters to burn the opponent for 800 damage, remove 7 counters to draw a card, or remove 10 counters to destroy a card on the field. Stardust Wish is a Continuous Trap that once per turn if your Stardust monster tributes itself to activate its effect (excluding the Damage Step as standard) you can target that monster in the grave and revive it while your opponent cannot respond to this effect and monsters Special Summoned off this effect cannot be destroyed by battle while in Attack Position. Righty Driver is a Level 1 Tuner that can substitute for any Synchron Tuner and upon Normal Summon can summon any Righty Driver from your hand, deck or graveyard. Finally, Lefty Driver is a Level 2 that can become Level 3 upon Special Summon and can banish itself from the graveyard to search for a copy of Righty Driver. Now it is time for the ZEXAL era. Number 39: Utopia Double is a generic Rank 4 of any two Level 4 monsters and during either player’s turn lets you detach a material from it to search for a Double or Nothing! 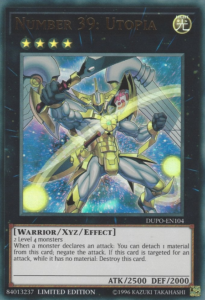 from your deck and then lets you Special Summon a Utopia monster from your Extra Deck while using Utopia Double and its materials as a material, doubles said Utopia’s attack, but prevents it from making direct attacks. Utopic Onomatopeia is a Level 4 that is always treated as a Gagaga, Gogogo, Zubaba, and Dododo card and during your Main Phase lets you Special Summon up to 1 of each Gagaga, Gogogo, Zubaba, and Dododo monsters from your hand in Defense Position but locks you to Xyz Summons for Extra Deck Summons for the turn. Shining Draw is a Normal Spell that can only be activated during your Main Phase 1 after you draw it for your normal Draw Phase and reveal it then upon activation will let you target a Utopia Xyz you control and either equip as many ZW- monsters with different names from your Deck and/or Extra Deck to it or you can instead Special Summon a Utopia Xyz with a different name using the targeted monster as material. Finally, Photon Advancer is a Level 4 that can Special Summon itself from the hand if you control a Photon monster and gains 1000 ATK if you control another Photon monster. Now it is for the Arc-V era. Odd-Eyes Advance Dragon is a Level 8 that can be Tribute Summoned using a Level 5 or higher monster and if Tribute Summoned can destroy a monster your opponent controls and deal damage to them equal to that monster’s original ATK and when Advance Dragon destroys a monster by battle, you can Special Summon a Level 5 or higher monster from your hand or graveyard in Defense Position. Performapal Smile Sorcerer is a Level 8 Pendulum Monster with a Scale of 1 and while in the Pendulum Scale, if a monster with ATK higher than its original ATK is destroyed by battle or card effect, then you can Special Summon this card from the Scale, while this card as a monster can search for a Smile Spell/Trap upon Normal or Special Summon and if all monsters you control are Performapal monsters, Odd-Eyes monsters, or Magician Pendulum monsters and this card’s current ATK is higher than its original ATK, then you can draw cards equal to the number of monsters you control with ATK higher than their original ATK but then you are prevented from Special Summoning for the rest of the turn. 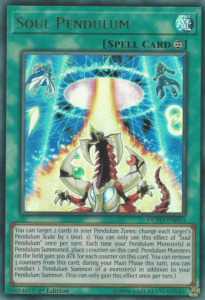 Soul Pendulum is a Continuous Spell that can target 2 cards in the Pendulum Zones once per turn and change their scales by 1, each time a monster(s) is Pendulum Summoned this card gains a counter, Pendulum Monsters gain 300 ATK per counter on this card, and you can remove 3 counters from this card to gain an additional Pendulum Summon for the turn. Finally, Predaplant Spider Orchid is a Level 1 Pendulum Monster with a Scale of 8 and while in the Scale can destroy another face-up card on the field during the Main Phase of the turn it was activated in the Scale, or while in the Monster Zone during the End Phase it was Normal or Special Summoned lets you discard a Plant to search for a Level 4 or lower Plant from your deck. Finally we get to the VRAINS era and their new cards. 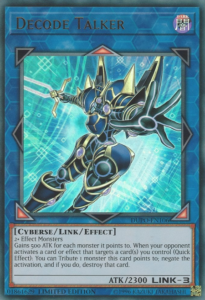 Cyberse Enchanter is a Link-3 of any 2+ monsters and it has Left, Right, and Down arrows and if you control this monster that was Link Summoned using Cyberse Wizard, you can target an Attack Position monster your opponent control and change it to Defense Position and negate that monster’s effects and if Enchanter is destroyed by battle or opponent’s card effect, then you can summon a Cyberse Wizard from your hand, deck, or graveyard. Backup Supervisor is a Link-2 of any 2 monsters and has Right and Bottom arrows and if it was Link Summoned using Backup Secretary and a monster this card points to battles an opponent’s monster, you can Special Summon a Cyberse monster from your hand at the end of the Damage Step and if Supervisor here is destroyed by battle or opponent’s card effect, you can Special Summon a Backup Secretary from your hand, deck, or graveyard. 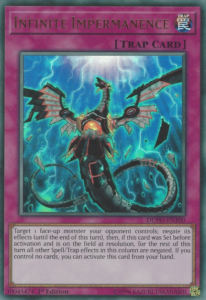 Decode Destruction is a Normal Spell that lets you target a Decode Talker you control and apply the following effects for the turn based on the number of monsters it points to: 1+ gives Decode Talker 500 ATK for each monster it points to, 2+ banishes any monster Decode Talker destroys in battle, and 3 destroys all cards your opponent controls after Decode Talker battles. 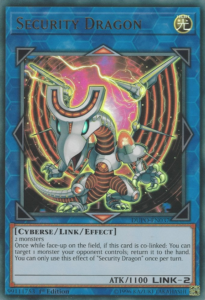 Doublebyte Dragon is a Link-2 of any 2 Link Monsters, has Up and Down arrows, gains 300 ATK times the Link Rating of the Links used as material, is unaffected by monster effects excluding Link Monsters, and can only be destroyed in battle by a Link Monster. 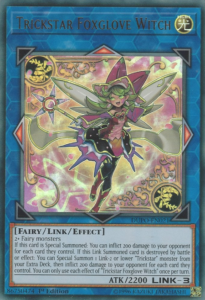 Trickstar Foxglove Witch is a Link-3 of any 2+ Fairy monsters, has arrows pointing Up, Left, and Right, inflicts 200 damage to the opponent for each card they control upon being Special Summoned, and if this Link Summoned card is destroyed by battle or effect, then you can summon any Link-2 or lower Trickstar from your Extra Deck and then burn the opponent for 200 damage for each card they control. 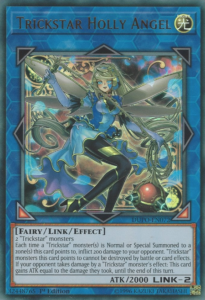 Trickstar Magical Laurel is an Equip Spell that can revive a Trickstar from the grave and equip itself to said Trickstar, but the monster is destroyed if this card leaves the field, and if the equipped monster deals battle or effect damage to the opponent then you can Special Summon a Trickstar from your hand. 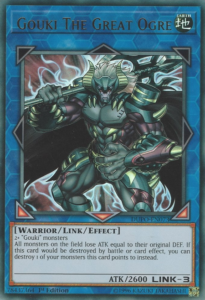 Gouki Jet Ogre is a Link-2 of any two Gouki monsters, has Left and Bottom arrows, once per turn lets you destroy a Gouki card you control to change all monsters on the field to Attack Position, and if it is sent from the field to the graveyard then you can boost all the Goukis you currently control by 500 ATK for the turn. 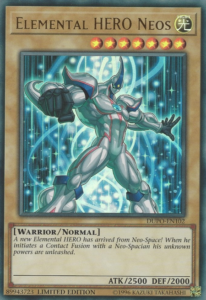 Gouki Cage Match is a Field Spell that gains 3 counters upon being activated, loses a counter when a Gouki destroys a monster in battle, and when it has no counters you can Special Summon any Goukis with different names from your hand or deck at the end of the Battle Phase and then this card gains 3 counters again. 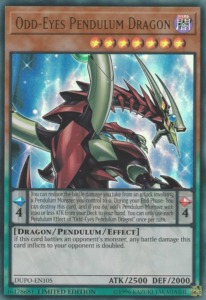 Booster Dragon is a Link-2 of any two Rokket monsters, has Bottom Left and Bottom Right arrows, can target another face-up monster on the field once per turn and boosts its ATK/DEF by 500 while your opponent cannot respond to this effect, and can revive another Dragon from your graveyard if it is destroyed by battle or card effect. 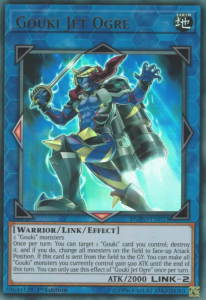 Tactical Exchanger is a Normal Trap that targets and destroys a face-up monster you control to Special Summon a Rokket monster with a different name from the destroyed monster from your deck. 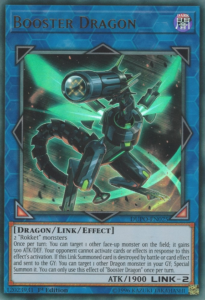 Finally, Security Dragon is a Link-2 of any 2 monsters, has Up and Down arrows, and once while it is face-up on the field and co-linked lets you target a monster your opponent controls and returns it to the hand. The final new cards in here are Link Monsters from the OCG that were either in the Link VRAINS Packs or were Jump Promos. Sure Security Dragon could of counted here, but it was in the anime so I put it previously. 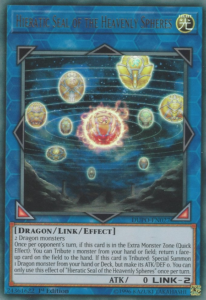 Hieratic Seal of the Heavenly Spheres is a Link-2 of any 2 Dragons, has Bottom Left and Bottom Right arrows, and once per opponent’s turn while Spheres is in the Extra Monster Zone, you can tribute a Dragon in your hand or field to return a face-up card on the field to the hand and if Heavenly Spheres is tributed, you can Special Summon any Dragon from your Deck but its ATK and DEF become 0. Crowley, the First Propheseer is a Link-2 of any 2 Spellcasters, has Bottom Left and Bottom Right arrows, upon Link Summon lets you reveal 3 Spellbooks with different names from your deck and lets the opponent randomly pick one to add to your hand while the others go back into the deck, and once per turn lets you Normal Summon a Level 5 or higher Spellcaster without tributing. 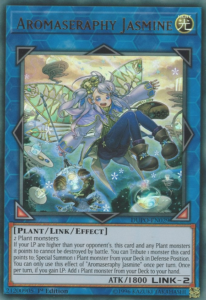 Aromaseraphy Jasmine is a Link-2 of any 2 Plants, has Bottom Left and Bottom Right arrows, if your LP are higher than your opponent’s then this card and any Plants it points to cannot be destroyed in battle, once per turn lets you tribute a monster it points to in order to Special Summon a Plant from the deck in Defense Position, and if you gain LP then this card can once per turn let you search for any Plant. Thunder Dragon Thunderstormech is a Link-4 of any 2+ Thunder monster, has Left, Right, Bottom, and Bottom Right arrows, during your Main Phase if you control this Link Summoned card then you can target a Thunder Dragon in your graveyard or that is banished and apply its effects that it would have if it discarded itself and then put that monster on top or bottom of the deck, and if a Thunder monster would be destroyed then you can instead banish 3 cards from your graveyard. Beat Cop from the Underworld is a Link-2 of any 2 monsters, has Bottom Left and Bottom Right arrows, and if it was Link Summoned with two DARK monsters then once per turn you can tribute a face-up card on the field to place a Patrol Counter on a face-up card you control and if said card would be destroyed you can instead remove that Patrol Counter. Finally, Platinum Gadget is a Link-2 of any two Machine monsters, has Bottom Left and Bottom Right arrows, cannot be used as Link Material the turn it was Link Summoned, during your Main Phase lets you Special Summon a Level 4 or lower Machine to a zone it points to once per turn, and if it is destroyed then you can Special Summon a Level 4 Gadget monster from your Deck. Now to get to all 60 reprints in this set (all are Ultra Rare like the new cards). 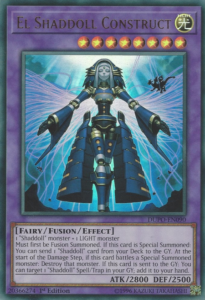 Toon Dark Magician Girl makes for a nice Ultra Rare reprint. Gold and Silver Gadget are nice cards to have on hand. Harpie Dancer gets its first reprint ever. The Winged Dragon of Ra – Sphere Mode will be good for competitive players and collectors while collectors will love The Winged Dragon of Ra – Immortal Phoenix. 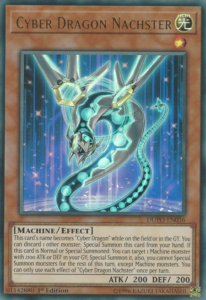 Divine Serpent Geh gets a printing in Ultra Rare that you could argue it deserved to have upon release after being so iconic in the show. Blue-Eyes Chaos MAX Dragon and Chaos Form are good reprints in Ultra Rare. Card of Demise is a great card to have still. 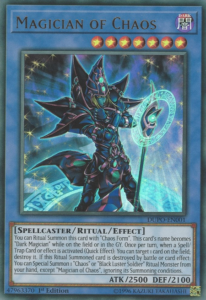 Dark Magical Circle and Eternal Soul are great for Dark Magician players. Vision HERO Vyon gets another Ultra Rare print, only this time not with the Duelist Saga Ultra Rare foiling. 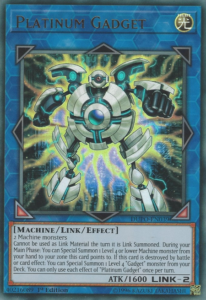 Ancient Gear Golem – Ultimate Pound might appeal to Ancient Gear players in Ultra Rare. Miracle Fusion is a nice holo reprint. Mark of the Rose is another nice foil reprint. 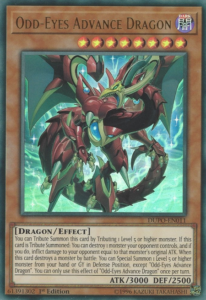 The three Hot Red Dragon Archfiends are finally in print again (Abyss, Bane, and King Calamity) and Abyss is great for competitive players playing with Guardragons. Star Seraph Scepter and Sovereignty are great to have in print once again. Galaxy Soldier needed another reprint. 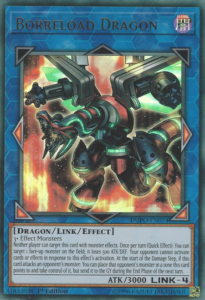 Galaxy-Eyes Full Armor Photon Dragon is a nice Rank-8 to have on hand for a Level 8 deck. Double or Nothing! 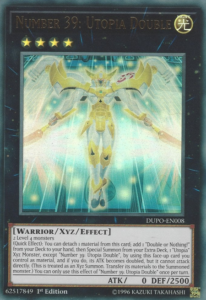 goes well with Utopia Double in here, and it’s nice to see Xyz Change Tactics get a foil upgrade. Predaplant Ophrys Scorpio gets a long overdue holo reprint. Frightfur Patchwork deserved a foil upgrade considering how good it is in Fluffals. 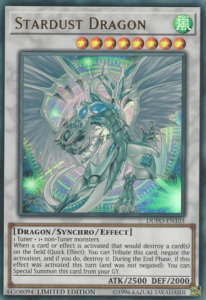 Crystal Wing Synchro Dragon is a good reprint to have once again. Predaplant Dragostapelia is a nice Ultra Rare reprint to use with your Super Polys. Link Disciple is a nice holo upgrade for Cyberse players. Linkuriboh is nice to have in Ultra Rare beyond the Jump Promo. 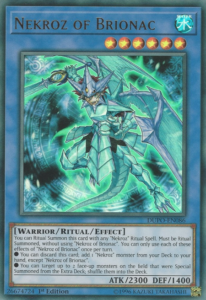 As I mentioned earlier there are alternate arts for Trickstar Holly Angel, Gouki the Great Ogre, and Borreload Dragon which are all good for collectors and Borreload is great for competitive players. The four Ghost Girl hand traps are always great reprints: Ghost Ogre & Snow Rabbit, Ghost Reaper & Winter Cherries, Ash Blossom & Joyous Spring, and Ghost Belle & Haunted Mansion. Zaborg the Mega Monarch is a much needed reprint for recent Ritual hype. Hieratic Dragon of Tefnuit gets a holo printing released to the public finally. High Priestess of Prophecy is another great card back in circulation. Aromage Jasmine and Aromage Rosemary both needed reprints. Many Nekroz cards got much needed reprints including Nekroz of Clausolas, Brionac, Trishula, Unicore, and Valkyrus along with having Shurit, Strategist of the Nekroz as well as Nekroz Mirror and Nekroz Kaleidoscope (for those wondering where Nekroz Cycle is, they said it would be in Battles of Legend: Hero’s Revenge). El Shaddoll Construct needed a reprint after coming off the Forbidden section and its nice to have El Shaddoll Fusion as well. Naturia Beast was out of print for a while until now. Hieratic Dragon King of Atum was much longer out of print and good for Dragon decks. Super Quantal Mech King Great Magnus is just in time before the Super Quant support. Shaddoll Construct is a nice holo upgrade. Qliphort Genius is an amazing holo upgrade. Finally it’s great for the two best Traps in the current format in Evenly Matched and Infinite Impermanence to get reprints, with Impermanence likely being the chase card. This set is very well designed. The reprints and new cards in here appeal to all the markets you could potentially think of. Collectors have those alternate arts and cards with great artwork and are relevant to the anime along with a few other cards. Casual players get some nice cards back in circulation with the Nekroz cards, Construct, Nat Beast, as well as having some really good staples and having a few holo upgrades in here. Competitive players have highly competitive new cards and reprints in here to help make deck building much easier and some of these new cards like the Aromage and Hieratic Link bring new experimentation to the meta. This set most likely has something in it for you and will be a very valuable set for a long time.